Heavy snow fall can damage roofs or even cause roof to collapse. Recent snow storm Nemo poured somewhere between 2-3 feet of snow in New England which could be devastating for many homes. 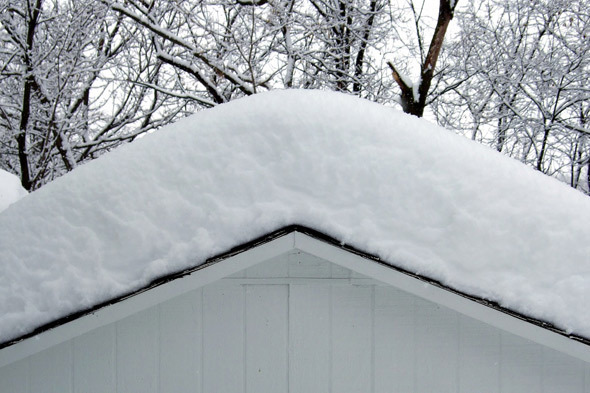 If your home had more than 2 feet of snow you must clean your roof to avoid a roof collapse. Of course, clearing roof tops may not be as easy. With all the snow on the ground as well as on roof top, it's a very dangerous job even for professionals. Superior Spray Foam Insulation, LLC is a licensed roofing contractor in Connecticut. Contact us for a free estimate to have your roof cleaned. Our service area includes: Northern New Jersey, NYC & Long Island, Connecticut, Rhode Island and Massachusetts. 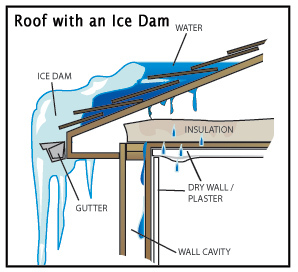 Ice dam occurs when water builds up behind a blockage of ice. Ice dams can occur in blockages of gutters and spouts on homes or buildings. As hot air escapes the house through attic, snow in the edge of roof top melts first and creates ice dams. If you notice ice dams in the edge of your roof-top, often times proper insulation may be the solution. Chances are you are paying too much to heat your house as the heat is escaping through the attic leaks. To prevent ice dams and stop heat loss, contact us for free estimate for attic and roof insulation. Ice dams are usually caused by heavy snowfall and improper ventilation in the attic. This causes warmer areas in your attic then the snow begins to melt, even when the outside temperature is well below freezing. When the accumulated snow on your roof starts melting it runs down your roof underneath the snow until it reaches a "colder" section like the eaves, overhangs, soffits, valleys or in gutters then it begins to freeze again, this process of thawing and refreezing is what causes an ice dam. Cleaning the gutters on your home can help prevent ice dams from occurring as quickly but they can still occur if the conditions are right. The gutters will be just as cold as it is outside and in some cases, full of frozen debris. So even if you don't have a soffit for the water to refreeze on, the melted water will most likely refreeze when flowing into the gutters. performing ice dam removal is risking severe personal injury and damage to the roof if not done properly. Never walk on a snow covered roof and make sure if your using a ladder you follow the proper safety procedures. We highly suggest contacting professionals with the proper equipment and roofing experience to carry out this job. Ice dams are a major cause of home damage in cold-weather climates. They can dump gallons of water into your walls, through your ceilings, and onto your floors. Insulation, drywall, furnishings, window treatments can all be damaged or destroyed. Because of our years of experience we at Superior Spray Foam Insulation, LLC know the right way to clear your roof. We are also fully licensed and insured.